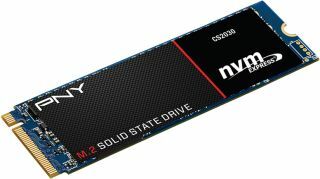 PNY is now selling its fastest solid state drives to date and also its first NVMe offering for consumers, the CS2030. These new drives are available in 240GB and 480GB capacities, both of them in the gum stick-sized M.2 form factor. The new drives are not the fastest we've seen, but they're certainly more performance-oriented than even the best SATA-based SSDs. That's because they're hitching a ride on the PCIe Gen. 3 x4 bus, which offers far more bandwidth than SATA III. Both capacities pair a Phison PS5007 controller with multi-level cell (MLC) NAND flash memory to achieve up to 2,800MB/s of sequential read performance and up to 1,550MB/s of sequential writes. They're also rated to deliver random read and write performance of up to 300,000 IOPS and 270,000 IOPS, respectively. Those numbers put the CS2030 in the same ballpark as Samsung's 960 Evo, though Samsung's SSDs are a little faster—both the 250GB and 500GB models offer up to 3,200MB/s of sequential reads, while write performance is rated at up to 1,500MB/s on the 250GB model and 1,800MB/s on the 500GB model. The performance discrepancy could be overlooked if PNY priced its drives competitively, but that isn't the case. PNY set MSRPs of $180 for the 240GB model and $330 for 480GB model. Samsung's 960 Evo SSDs street for $130 (250GB) and $250 (500GB). In any event, PNY's CS2030 SSDs are available now and backed by a 3-year warranty.